fireplace for chilly nights. Deck and screened porch facing lake. Satellite internet. 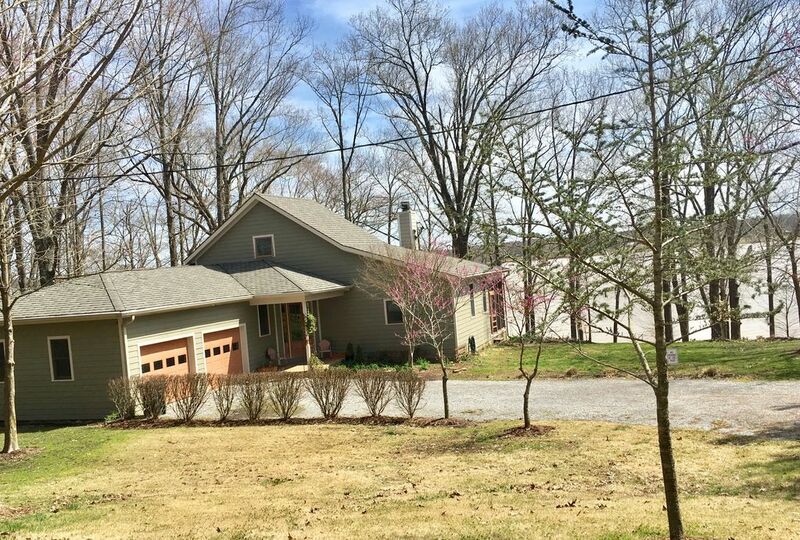 Sits on approximately 3 1/2 acres plus TVA land. Great for families, duck hunters, fishermen, etc. Long term rentals welcome as well. I grew up in Mayfield KY about 20 miles from the lake. I now live in St Louis MO. My husband and I built this house so that we could visit our aging parents without the hassle of packing and unpacking all of the time and with a view toward retiring there someday. The house was built for us, not as an income property so it has many touches that other available houses do not have - huge fireplace, oversized windows overlooking the lake, high end appliances, high ceilings, tall doors,maple and cherry floors in the bedrooms, cherry handrails, large yard (3+ acres) etc. After 3 of our parents died, we no longer came to the lake as often but could not bear to sell the house where we had spent so much quality time and where our grandchildren had made so many memories. We decided to rent our house through Homeaway to defray the cost of keeping our part time home and so that others could create great memories there as well. Since we live in a large city, we wanted a place that was away from the hustle and bustle. We found that here. The house sits on 3 acres plus TVA land. We have deer and other wildlife everywhere. At night the stars are very bright and unobstructed by light pollution. You hear the sounds of nature instead of the rumble of cars. We love that you can see the lake from every room of the house. It just embraces the lake. Additionally the bathrooms have views of the woods. Sitting on the deck at night with a fire or watching the moon rise over the lake is a priceless treat. Kids can play in the woods or yard and you do not have to worry about them. It is just a good place to be..
Master bath has jacuzzi tub and separate shower. Second bath has a shower. We have a long driveway but it is difficult to turn a boat around at the bottom by the house. Please leave boats and trailers in the designated area along the driveway. Great room with vaulted ceilings and floor to ceiling windows. Currently Dish but may be DirecTV in future. Kayaks and paddles available for use at your own risk. No charge. Guest responsible for returning Kayaks and paddles to their original location ans locking them with provided cable. We really enjoyed our stay. Caught a few fish! What a view. Thank you for sharing your home with us. Melinda’s home was beautiful. The view is stunning and the House was better than expected. This was the perfect home for a weekend away. Thank you! Beautiful relaxing home on Kentucky lake. Our family of 4 adults 2 children and dog felt at home. Melinda had Christmas lights on the fire hearth which was such a nice touch during the holidays. We really enjoyed our stay and hope to stay again soon. The home and rural setting is absolutely stunning! I would highly recommend this home to couples or families to enjoy. The home has many of the very things that we enjoy in our very own homes. We saw a family of deer nearly every morning. Thank you for sharing your beautiful home with us and many other families. May God bless you and your family. We enjoy the deer too. As fall and winter approach we are also seeing white pelicans and the eagles are hunting in the bay. There is beauty in every season here. Beautiful, comfortable home with an incredible view of the lake. Loved the private dock! This is our 2nd stay here and we love this house. It’s clean and beautiful. We didn’t want to leave! Well furnished and the kitchen is very nice, supplied with everything we needed to cook all our meals. Wonderful home for a family vacation! Your beautiful home was better than we could have even imagined from the pictures. Myself, my husband, three adult daughters and son-in-law stayed there last week. The views were beautiful, everyone was comfortable and we had a great time on the dock/lake. There was a marina a few miles away and enjoyed renting a boat for a couple of days. The house was also near other local attractions. Thank you for letting us rent your home and create special family memories! Thank you very much. We try to respond to guest suggestions and keep our home updated for everyone’s enjoyment. The ventilation fan and lights on the dock were new this year and everyone seems to be enjoying them. Again, thank you for your review. hammock on the dock. Float in the lake and sun or, if you bring your boat, enjoy boating and tubing/skiing on Jonathan Creek. Fall color is gorgeous. This house is surrounded by woods and is not in a subdivision. Two kayaks available for tenant use. The house is on Jonathan Creek which is one of the large bays of Kentucky Lake, one of the largest manmade lakes in the world. Other Activities: Boating/fishing (guides available nearby)/ hiking TVA lands around the house and Land Between the Lakes. Golf: Many golf curses available nearby. Ky Dam golf course is a well maintained 18 hole course. Kenlake has a very nice 9 hole course. Miller Golf Course is operated by Murray State University and is excellent. There are many others available in the area. $300 deposit is due at booking. Rental fee is due 15 days before arrival. Refund is subject to re-rental of your dates. Thanksgiving, Christmas and New Year rates are $350 per night with 3 night minimum. Full week rentals only in July. For monthly stays or longer, contact owner for a quote.